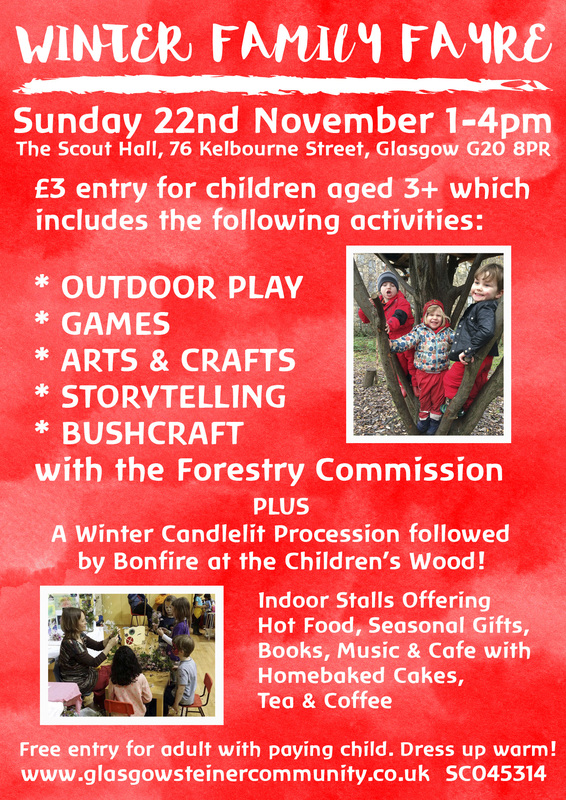 Our Winter Fayre and Fun Day will be on Sunday 22nd November from 1-4pm at The Scout Hall on Kelbourne Street in Glasgow. We have lots of fun activities planned inside and outside, with help from The Forestry Commission for Bushcraft. Lots of beautiful handmade gifts and our Cafe with tea, coffee and homemade cakes. Please spread the word and we’ll see you there! 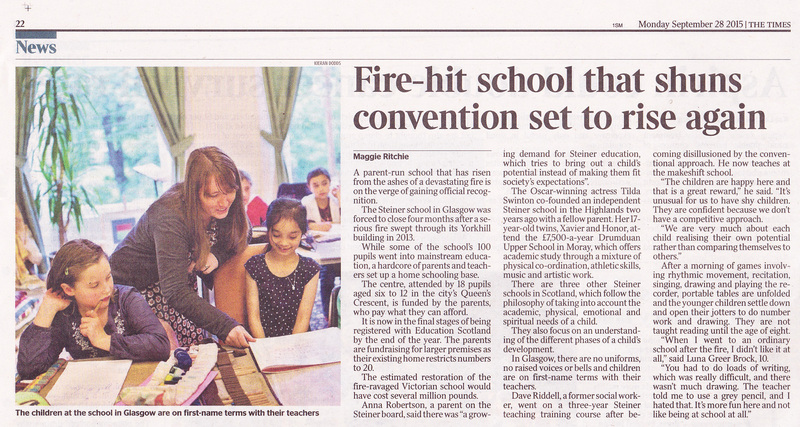 A great article in The Times today about our plight to restart Steiner education in Glasgow & find a new building. If you can help in any way or would like to donate please visit our ‘Support Us’ page. All the children are so delighted now Kinde is registered and full length again! 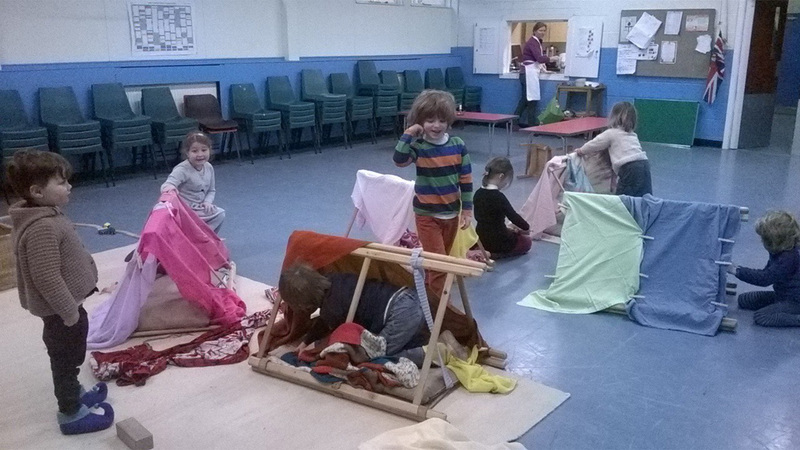 Free play indoors is longer and they even made apple pie this week. They have been exploring the wild garden for an hour per day playing freely, climbing trees, building a tyre swing and picking brambles. Such a lovely time of year to explore the outdoors. Marzena is delighted to have the time to tell the children stories again and has some lovely puppet sow planned for the following weeks. 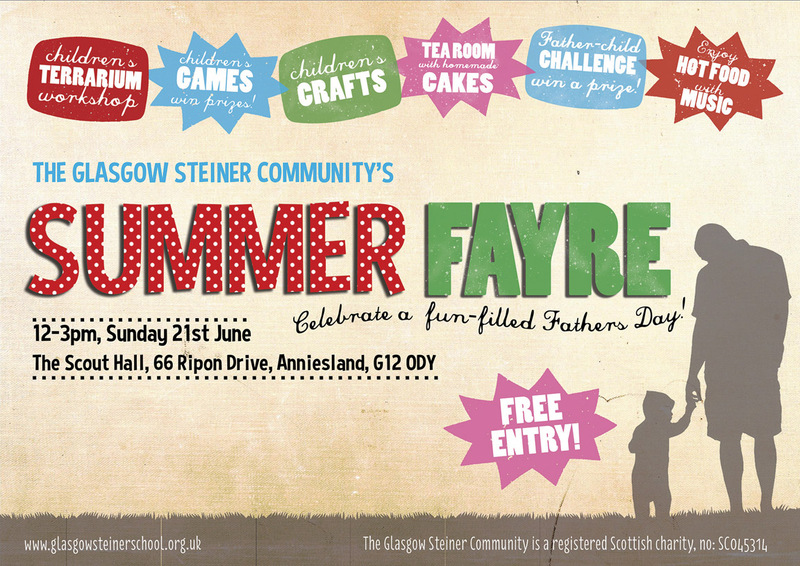 Our summer fair will be at the Scout Hall in Anniesland where we hold Seedlings & Toddlers on Sunday 21st June from 12-3pm. It will be a celebration of children, summer and Fathers! Please join us for a fun day out and tell your friends! What are the fundamental elements of childhood, and what do children truly need to flourish? Lou will explore ‘Conscious Parenting’ ideas to build greater connection, communication and creativity into family life. As well as practical and fun suggestions for making ordinary family moments extraordinary, and to create happy children, happy homes Lou will also discuss how to transform behaviours in a positive manner, create more relaxed and connected relationships, and teach children skills that will help them throughout their lives. Popular Creative Discipline ideas to end. Lou Harvey-Zahra is a mother of two, a Rudolf Steiner, primary and special needs teacher and playgroup leader. She is a co-founder of a government school with a Steiner-inspired curriculum in Melbourne (Australia). Lou is a popular parenting author of three books. 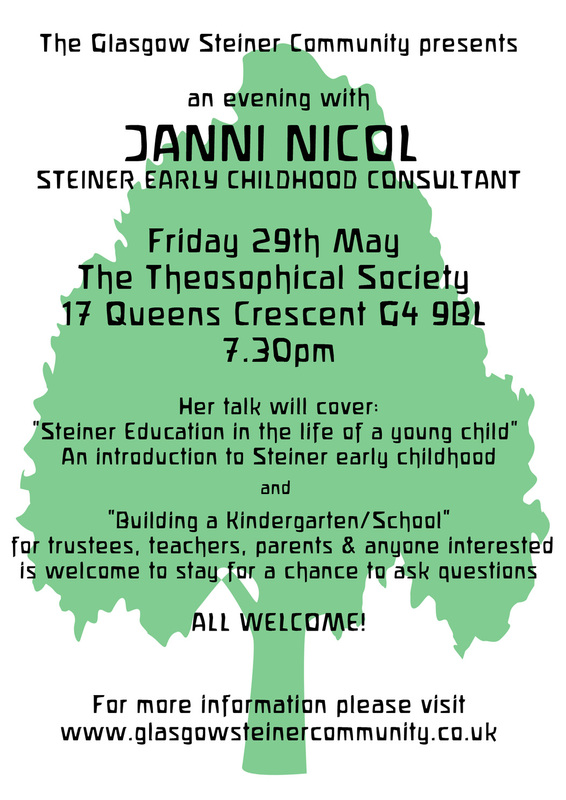 We are delighted to announce that Janni Nicol will be joining us for a talk about Steiner Education on Friday 29th May. Janni is an expert on Steiner Early Years education and this is a great opportunity to find out a bit more about the world of Waldorf and to ask questions. Please see flyer for details and all are welcome to attend. Well the Spring/Summer term is off to a fine start! Sunshine, warmer weather and lots of energy after the Easter break. Parent & Toddler group starts this Friday 24th April and runs for the next 9 weeks until summer holidays (except May weekend). Mira welcomes new families to the group and you first ‘taster’ session is free, just let us know if you’d like to come. We’re looking forward to making the most of the garden this term with the little ones and some lovely craft activities for the parents. The Seedlings children skipped into class yesterday morning, happy to return after the break. With May Day on the horizon and the garden starting to bloom this will be an enjoyable term for us all.